Book Review: Sweet & Savory Fat Bombs + Giveaway | Low-Carb, So Simple! Besides her excellent KetoDietApp, Martina has written a few cookbooks, “Sweet & Savory Fat Bombs – 100 Delicious Treats for Fat Fasts, Ketogenic, Paleo, and Low-Carb Diets” being her newest creation. I was lucky to get one copy for review purposes. 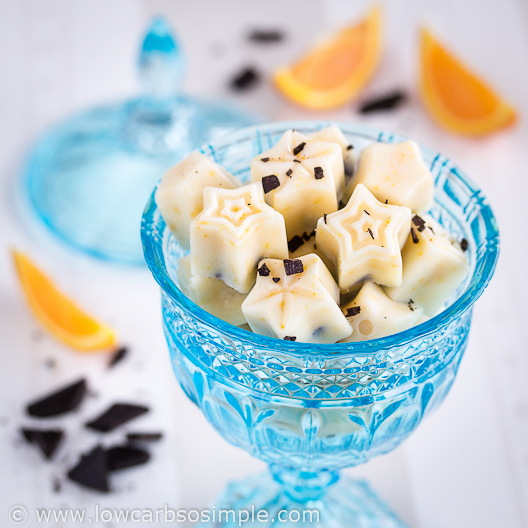 Already the cover is mouth-watering: several fat bombs featured in a lovely photo. For those who are not familiar with the concept of fat bombs, the book gives a concise introduction. Also the ingredients used to prepare fat bombs are clearly described and explained. The book contains recipes for some essential basic ingredients, too, from Chocolate-Hazelnut Butter and Almond and Cashew Butter to fancier Eggnog-Macadamia Butter to Spiced Maple and Pecan Butter. There are also recipes for homemade dark and white chocolate. Often, fat bombs are considered sweet creations. However, personally, I often crave something savory and salty. Therefore, I’m happy to notice the book includes several savory fat bomb recipes as well. Pepperoni Pizza Fat Bombs, Waldorf Salad Fat Bombs — you name a dish and it’s certain Martina has created a fat bomb version out of it! To my surprise, there are many liquid fat bomb recipes as well. I’m a huge fan of keto smoothies and often make those myself, so it’s great to find recipes for further ideas. I will definitely try Raspberry and Vanilla Smoothie and as an ultimate pumpkin pie fan, the Pumpkin Pie Smoothie. For this review, I wanted to choose and prepare one recipe from the book. Now, how difficult is that task considering the whole book is full of fantastic fat bomb recipes?! I skimmed through the book, trying to decide which of the delicious-looking recipes to choose. I really loved those professional, mouth-watering photos Martina has taken, they really added to the polished, professional look of the book. Finally, as a great fan of the orange flavor, I chose the recipe for Quick Orange Fat Bombs. Orange is a wonderful-tasting fruit, but too high in carbs for a ketogenic diet. Because I really like orange, several years ago, I found a way to get the full orange flavor in low-carb food and drinks with grated orange peel. Moreover, orange peel gives a more elegant and multi-dimensional orange flavor than just orange juice, which in turn gives a somewhat “flat”, though juicy, orange flavor. Nowadays, I use a drop or two of 100% orange essential oil as an alternative. That is a great option if you want to have a smooth result without those tiny pieces of orange peel. Here, in her Quick Orange Fat Bomb recipe, Martina uses the grated orange peel to give that elegant, fruity orange flavor. Alternatively, you can use sugar-free orange extract. The recipe for Quick Orange Fat Bombs sounded perfect: it was easy to make and had only 5 ingredients. As an optional ingredient, you can add liquid stevia if you need more sweetness. I’ve tried to wean myself off from overly sweet flavors, so I was sure the fat bombs would taste sweet and delicious enough with no additional stevia. The recipe had powdered erythritol as a sweetener, so I was sure that gave enough sweetness. Nowadays, I find it easier to make powdered erythritol myself. With a high-speed blender and an appropriate jar, you’ll get perfect, finely powdered erythritol in less than a minute. I had to order the coconut butter the recipe called for, which took a couple of weeks. Believe or not, ordering from the other side of the world became cheaper than buying the coconut butter from the local health food store. Finally, I got all my ingredients — including the mold — and prepared the recipe. … and melted them over a very low heat (140 °F = 60 °C). Then, I added the orange peel and powdered erythritol. I mixed the mixture well to combine everything. Next, I took a star-shaped silicone candy mold and filled it with the mixture. A final touch of finely grated very dark chocolate (I used 90% Lindt). And then to the fridge for an hour. Ready! Oh my gosh, these look delicious! And now a bite… I think I’m in heaven! I love the combination of crunchy chocolate chips and fruity orange. This recipe is a winner! I did some further experiments. I bet if I added some vanilla extract, it would give a hint of white chocolate taste. So, I had to try it out. For one batch, instead of orange peel, I used 3 drops of 100% orange essential oil and added 1 teaspoon organic, alcohol-free vanilla extract for a delicious vanilla flavor. Another experiment I made with turmeric. Since turmeric has some “super powers”, i.e. it has an amazing ability to heal different ailments, I added 1/2 teaspoon of ground turmeric to one batch. I naturally was after the yellow color, too, which was a perfect addition to this orange-flavored fat bomb recipe. Melt the coconut butter and coconut oil in a double boiler, or heat-proof bowl placed over a small saucepan filled with 1 cup (235 ml/8 oz) of water, over medium heat. Add the orange zest or extract and erythritol or Swerve. If you want a sweeter taste, add the stevia. Mix well to combine. Fill a silicone candy mold or mini muffin cups with about 1-tablespoon (15 g/10.5 oz sic! I think it should be 0.5 oz) portions of the coconut-orange mixture. Top with the cacao nibs or chocolate chips and place them on a tray. Refrigerate for 30 minutes to 1 hour, or until solid. Keep refrigerated for up to 1 week or freeze for up to 3 months. Note that coconut oil and coconut butter soften at room temperature. The recipe makes 16 fat bombs. One fat bomb (= one serving) has 1.0 g protein, 12.8 g fat and 1.2 g net carbs. If you follow a ketogenic or other low-carb diet, fat bombs come in handy. Since lacking fat is one of the most common mistakes people make when following a ketogenic diet, fat bombs really help you get the needed fat to keep your system in good condition and to keep away fatigue, constipation, tiredness, etc. It’s a good idea to prepare some fat bombs beforehand and store them in the freezer. When you need more fat, just quickly pop one (or two) fat bombs in your mouth, and you are good to go. “Sweet & Savory Fat Bombs” tells you everything you need about all kinds of fat bombs and gives a whopping 100 recipes for basic, sweet, frozen, liquid and savory fat bombs. The book is a must have for any person on a ketogenic or low-carb diet. The book gives precise nutrition facts, which is a must if you count your macros strictly and nice to have in any case. You get the macros both as grams and as percentages. I’m happy to notice that Martina has created another winner, so, this book is a must have! Don’t forget to visit Martina’s blog for more scrumptious recipes. Hi Jay, I’m afraid regular butter doesn’t work here… however, here is a recipe for fat bombs where butter works perfectly, have you already tried this one: http://www.lowcarbsosimple.com/guest-post-strawberry-cheesecake-fat-bombs/ ? Fatbombs make me eat less food and keep cravings under control. Fat bombs meet my needs for a sweet treat whilst assisting in meeting my fat intake. Just love the different flavors. As a type 1 diabetic I love fat bombs for the guilt free sweet hit with the need for extra insulin. I love fat bombs because they help me when I need a treat….like a dessert. I’ve lost 30 lbs since using Martina’s Keto app. I definitely have a sweet tooth and fat bombs definitely ease that craving 🙂 I can’t wait to try this recipe! Fat bombs are essential on the keto diet, need a little extra fat boost or help stop a craving, I love fat bombs do the trick every time… Thanks for the opp to win a book. on Keto diet I often do not want/need to eat so a savoury or sweet Fat bomb does the trick. Keeps my fat intake and energy levels high. Brilliant invention! Fat bombs are brilliant for helping me keep my hands off carby snacks in a household where no one else is doing keto! Fat bombs are perfect when you just need to satisfy that little snack craving! I love fat bombs because they are a simple way to get your required fats in. They are so versatile that you can make them savory or sweet! It’s a healthy and quick alternative to conventional sweet treats that are loaded with sugar and carbs, With minimal healthier carbs and healthier sugars for our bodies, it’s a win win for everyone! My kids even like them and sometimes convince me to let me share a couple with them, LOL! so you know they truly are delicious! This also tells me its not just me psyching myself up to eat something that I don’t really like! 😛 They’re truly satisfying especially after coming home from a work out, I can have a fat bomb (or two) and not pick at the dinner I am preparing. They have truly been lifesavers in sticking to the keto plan. I have for a couple years been hoping and working hard to get off my metformin (for insulin resistance) and high blood pressure medications, and the keto diet and fat bombs have already shown great results in getting me on that path. I hope that I can get more recipes to do other kinds and share with friends that are looking for a long term solution to their weight problems. I love fat bombs because they give me a great way to curb cravings and feel full, even when I’m PMSing and need a little extra food in my life. Fat bombs keep the keto magic going strong! I love fat bombs because … FAT BOMBS! The name says it all! Sweet or savory, fat bombs are, by far, the best treats ever created for those of us who follow a keto/LCHF lifestyle. Martina’s latest cookbook, “Sweet & Savory Fat Bombs – 100 Delicious Treats for Fat Fasts, Ketogenic, Paleo, and Low-Carb Diets” is exactly what I need because I tend to make the same recipe over and over and over … I definitely need to incorporate more variety into my food plan to keep it new and exciting! Fat Bombs give me a little something sweet, without knocking me off plan! I sometimes have difficulty getting enough fat in so this is a great way to increase my intake. So satisfying too! Fat bombs are the bomb when I’ve had a busy day and haven’t been able to cook properly. They give me enough boost to get to the next meal. Fat bombs are a great, quick, delicious way to make sure i am hitting my macros. They are also a great way to have a “treat” when I am having cravings that might make me cave otherwise. I really love fat bombs because they help me meet my fat requirements in a delicious easily controlled manner. I often use them as a “snack” on the days I need to balance my macros. Fat bombs are great to take to work and have something ready for when you feel in need of some clean energy. Keto eating has completely opened my eyes. I have tried on an off being paleo and joined many challenges, but recipes tend to be very long and complicated, less straightforward. Fat bombs are such a discovery! I never thought snacking would be so delicious and also so much fun and quick to make. I am always craving to eating my next strawberry cheesecake or orange chocolate fat bomb, you name which one, plus they look so pretty! I live in Barcelona and currently it’s so hot here that everyone is always having an ice cream in the street – freezer fat bombs are THE best summer alternative, definitely satisfy me in the same way if not more, and with the sugar-free bonus! I like the idea of fat bombs because I don’t think I get enough fat in my diet. Being from Nigeria means that a lot of the ingredients taken for granted in making them is not easily available. I’m hoping for recipes that will help me adapt local ingredients. I have tried several fat bombs from the book and all I can say is HEAVEN !!!! Because it is simple to get the required amount of healthy fats into the body. I am in love with fat bombs because they give me a no-brainer way to fill in my macros for the day…and of course they taste delicious. Martina’s recipes are the best! I absolutely love a good fat bomb or two in the evening when I still need to consume more fat (a LOT of days! Lucky me!) It makes the time after dinner so enjoyable. I especially love a raspberry chocolate one that I make. I love these and even have my doctor’s approval for this way of eating. The fat bomb book sounds divine! Fat bombs are great if you are doing a fat fast to accelerate into ketosis. I use these daily as a delicious and nutritious food to keep healthy levels of good fats in my diet. I make these chocolate (70-85% Cocoa) and coconut oil with crushed macadamia nut fat bombs that everyone in my family loves. I am always wanting to try new recipes and these ones here look great! I love Fat Bombs. They are great to get the needed fat for a Keto dieta and a great way to eat some sweet treats. I love them. Thanks for the wonderful recipes. I love fat bombs becuase they allow me to satisfy my sweet tooth guilt free! Keto candy!!!!! I have a huge sweet tooth when I know I can’t have sweets. These are great ..
To be honest, I have never had a Fat Bomb. Don’t get me wrong they all look so great, but just starting out on keto and I haven’t had the monies to order your new book or try to make them with all of the new foods to buy and the stuff to make things with. I have been on a ketogenic diet for the last 3 months and quite early hit a plateau in my weight loss. A closer look at my macros lead me to believe that I wasn’t getting enough fat with my meals. I love Fat Bombs because they are imperative for me to keep my fat ratio up and reach my goals. I only have a couple of go-to’ fat bomb recipes and Martina’s book would be so helpful to bring some variety into my meal plans! I have trouble finding enough fat to add when eating, so Fat Bombs are so necessary! I cannot wait to try this one! I love fat bombs because they allow me to still reach my fat goals without overdoing dairy—which is very easy for me to do. Whenever I’m craving something sweet, these babies come to the rescue! Easy to make and it calms my sweet cravings! fat bombs are the key to me losing weight on a keto diet!! Why I like fat bombs… they aren’t just for me, I make them for the kids! SO much better than anything I could buy at the store. I control the ingredients!! I make them with only ingredients I feel confident in using and as a mother that is HUGE!! We can take them to parties, I keep them in the freezer, I have given them as gifts at Christmas, I take them to school on ‘bring a snack day”… I need this book for more recipes!! I keep getting it from the library. I own your cookbook and adore it. Thank you and keep up the amazing work. It is much appreciated!! I love fat bombs , I start my day with coffee and cream and a couple of fat bombs.That keeps me happy till 1pm when i have brunch, Then for afternoon snack around 4pm coffee and fat bombs!. Delicious, nutritious and good for you. Fat bombs keep my brain happy in the afternoon! I love fat bombs for snacks, energy boosts, and just as a way to sit down and relax with a treat. This book is on my wishlist! Thanks so much or the chance to win it 🙂 I am especially excited about the savory bombs – I think they’d be super for taking to potlucks and such. I enjoy fat bombs because I feel completely satisfied after eating just one or two. Fat bombs are what keeps me on track. When I am craving something sweet I know I can grab one of these, satisfy my craving and still stay on my keto plan. Can’t wait to win the book! New to Keto diet and would live to try fat bombs… The book would be a great way to try some recipes! I’m just now starting the keto diet, and am tapering off to 20-30 gross grams after this week. I’m already seeing that I need more fat, and reading up on fat bombs sounds amazing! I’m also like you, I’d prefer the savory and salty ones over the dessert ones. I only wish I could eat fat bombs for breakfast, lunch, & diner! I love fat bombs when I need a quick snack that is filling and feels like a treat. Fat bombs are freezable, packable, and prevent any hint of deprivation-thinking. They’re the bomb! I have been on keto for 8 weeks and I’ve found that fat bombs are a major contributor to staying on track with fat intake and fighting cravings. If I have a craving, I grab a quick fat bomb from the fridge and it’s all taken care of with no cheating. I used fat bombs to get my husband to switch to keto (“how can I give up treats?”). I’ve got 3 or 4 go-to recipes but I’m really looking for more variety. I’m going to make these orange ones this weekend and I’m super excited to discover some of the savory recipes. I’m a mental health therapist and often times don’t have time to eat between clients. Fat bombs are a quick way for me to eat something and provide me with energy and some good fats in between when I have time to eat a full meal. They also serve as a great snack that keeps me on track with my Paloe/Keto diet. I would love a copy of this book to try all of the flavors! I have a huge sweet tooth! Fat bombs help me satisfy that sweet craving and I get the fat that my body needs! Perfect package! Fat bombs are so good and filling!! Fat bombs are a must for me to get in all the fat I need for the day, and they are a perfect small dessert. I mostly make sweet versions. Thanks for the chance! I love fat bombs for the simple reason that they make the whole keto diet work. I had tried eating ‘low carb’ before and was always hungry. After starting this eating plan with some friends, I realized that the fat bombs were the difference between success and failure. 12 pounds lighter! Thanks! Taking in healthy FAT to balance my micronutrients is easier with FatBombs. The deliciousness adds an unexpected delight in the dessert family when eating veggies and meats as the staples. Fat bombs are a healthy and satisfying way to erase hunger pains and to lose weight. Most fat bomb recipes areal fairly easy to make. It’s so nice to have a cookbook with recipes for all types of fat bombs. It makes life so much easier. Fat bombs make me stay hunger free!! They taste awesome too!! Fat bombs are my favorite way to jump up my fat intake. They let me feel like I’m treating myself without sabotaging my progress! I love fat bombs! They are yummy delicious, filling, and most of all they satisfy me. I love fat bombs because they’re so delicious! They really satisfy my sweet tooth and fill me up so I’m less likely to snack. Fat bombs are so delicious! Can’t wait to try this newest recipe! I LOVE making fat bombs, there an excellent way to ensure I get in my fat, they’re delicious and help conquer my sweet tooth…especially when the kids are chowing down on their ice cream. I made my first batch of fat bombs yesterday. I will continue to keep them handy for a quick treat for either between meals or as a night time snack. I’m curious about the new cookbook now! I’m looking forward to trying this recipe. I too will have to order the coconut butter and silicon molds and have to wait to make this recipe, lol. I LOVE Fat Bombs because they are usually so easy to make and so satiating for such a small item. I can’t forget that they taste great as well. JUST L O V E THEM! Fat Bombs are delicious and really satisfy my sweet tooth. Would love to have more recipes for them. When I have the craving for something sweet, my go to is a fat bomb! My most favorite has been the lemon cheesecake bomb as I love citrus. Going to make the above orang fat bomb tonight! They just stop me from wavering off my lifestyle at the end of an vening . I don’t feel as though I am missing something. I have not tried Fat bombs yet, but they look delicious and I definitely want to add them to my go-to recipes! I’ve never tried fat bombs but they look delicious and I definitely want to add them to my go-to recipes! I am only 6 weeks on the keto WOE and I am hooked!! My entire family has adapted KETO and we love watching each other’s successes! Fat bombs are my saving grace and the only way I’m able to keep my fat intake at a higher level. So far, I’ve found some recipes online and made up a few of my own. I can’t wait to build a nice collection of keto friendly cookbooks!! I have never had them before and would really like to try them. Fat bombs are my favorite way to satiate my sweet tooth! Chocolate and coconut flavors are my staples but I’m still fairly new to keto and have so much more to try out! Near the end of the day, I often scramble to meet my fat macros. Fat bombs makes the process so much easier so that I can meet my macros with one convenient little snack and avoid having to play Sherlock Holmes in my kitchen trying to detect the best thing(s) to eat w/o going over my limit. Fat bombs are the best. Fat bombs are such a quick way to get your macros on the go! Plus my kids love helping me make them with fun molds! Oh wow! This looks so yummy. I have never tried “fat bombs” before, but look forward to trying this and other recipes like this one. Looks like the book would be awesome. Oooo yummy. I have printed the recipe you shared and cannot wait for the weekend to try them. I am new to LCHF lifestyle and still battle with the nibbles in between. Thank you for all your sharing, I love reading your Blog. I have never had them. They look very delicious. I am a Type 1 Diabetic and am working on going to a lower carb diet and including more good fats. These look like an amazing way to do that. Fat bombs are so good. Great to get your fats in, plus I find the ones made with coconut oil tend to rev up my metabolism, plus help me not be hungry. So many good ones out there. Fat bombs are a great pick me up on the Keto diet and are delicious at the same time! Never had fat bombs but they sound scrumptious & would love to try them! Fat bombs are awesome!!! All variations are a scrumptious satisfying healthy treat. Fat bombs are keto candy. Nice to have on hand because sometimes I just need food. NOW. Also great to close out a meal of veg and protein…it just makes it feel like the meal is done and finished in style instead of that lingering feeling of wanting something more. I made fat bombs just a couple of times. I have been trying to get all the ingredients for things on hand so when I see a recipe I will be ready. I find the idea of them very interesting. I went from never cooking anything to making all kinds of things and stocking my kitchen up. I have a problem having enough fat in my diet. Fat bombs are the best way. Inaddition, they taste great not gross. Fat Bombs have kept me on my weight loss journey necessary for my health and to hopefully reduce my use of insulin for my type 2 diabetes. Before them I was ALWAYS hungry, but fat bombs keep that hunger in check without increasing my carbs. I have never made a fat bomb but these look easy to make. would love to try these and more ! Fat bombs are an easy way to get a quick snack, without messing up my daily carbs! I love how versatile they are, and I make several different flavors at a time! I have a hard time getting in all my days daily so learning more about fat bombs and getting new recipes will really help. This book looks great! Thanks for all your great ideas – when you have “that” craving – this really helps out – and you feel really good and satisfied at the same time – awesome!!! Fat bombs helps keep my sugar cravings at bay. Love them! I’ve never tried a fat bomb, they look like an interesting alternative to putting olive oil in and on my food! Fat Bombs make you feel satisfied and are an elegant treat! Love them! And I love this recipe! I have Martina’s other book and it’s wonderful! Far Bombs are great to get the needed fat for a Ketogenic diet. I love fat bombs. Not only do they keep me in ketosis, they give clarity to my brain, give the extra boost of energy I need and take away any hungry feeling I may have. I love this website. Thank you so much. 5 ingredients, healthy and delicious. What else could we possibly want? Fat bombs are like candies for me and I must try this recipe. I would love to win the book. I check my fat macros daily and when I see I need more just pop one or two Fat bombs. So easy and convenient when you make them ahead of time. Always looking for more good recipes. I love fat bombs because I have trouble getting enough fat in my diet. It’s tricky trying to cook for myself and my husband and three older kids who aren’t following a keto diet. My youngest is on Keto for seizure control, but is tube fed so it’s easy for him to comply. I also like them because they feel indulgent. i HAVE YET TO TRY A FAT BOMB SEEN MANY RECIPES YOURS SOUND GREAT ! I have trouble getting enough fat in my days and fat bombs are the easiest ways – and, really, the most delicious – ways to do that! I still have a sweet tooth, though, so I love getting my quick fix of yum in! I love fat bombs because they help satisfy my appetite.